From the University City Democratic Club: Meet us at the Smokeyard … and let’s have a good time! 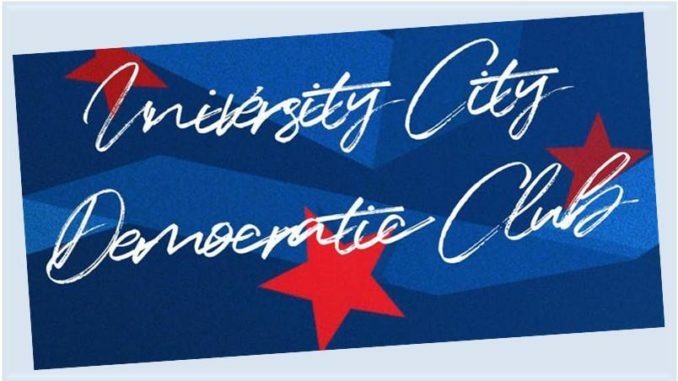 The newly launched University City Democratic Club is hosting a community mixer (with Drinks and Hors D’oeuvres) on Monday, January 21st (Martin Luther King Day) at the Smokeyard at UTC. This event is an opportunity to regroup and network with our new founding members as we wait for charter approval. It’s also an opportunity to reach out inclusively to our community-at-large and to our invited guests from the Black American Political Association of California (BAPAC). In honor of Martin Luther King Day, a portion of the event proceeds will be donated to BAPAC Youth Activities. Parking Suggestion: Best parking is on the southwest side of Macy’s accessible from the Lombard Place entrance to UTC Mall on Nobel Drive.